Every artist needs a sketchbook to draw on the go and to quickly capture ideas. But picking the right sketchbook can be dizzying with so many options, not to mention different sketchbooks excel at different things(charcoal, toned paper, markers). 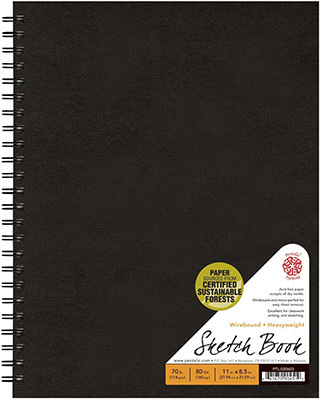 If you just need a solid reliable sketchbook for drawing then your best choice is the Pentalic Sketch Book with a spiral bound spine. All pages measure close to A4 size and they’re all perforated so you can tear out any sketches that you wanna keep. Also the hardbound covers can offer working surfaces to draw anywhere! You can take this sketchbook to the park, on the train, or anywhere you want to draw. This Pentalic sketchbook is sturdy and super easy to carry around. The strong front & back covers are easy to lean against when sketching and the wire binding stays out of the way whether you’re drawing, painting, or just doodling. But you should know that not all sketchbooks are made equal. Pentalic is a solid choice for someone just looking to sketch—but what about doing finished drawings? Or rendering with chalk or ink? In this guide I’ll explain the different types of sketchbooks and how to select the best one for your needs. The first thing you need to consider is why you’re getting a sketchbook and how it’ll be used. Do you want to draw illustrations and color with marker? Or do you want to use watercolors? Or maybe you want toned paper to work on a fixed background. There are so many different styles to choose with different sizes, brands, and paper types. Most beginner artists just need a simple sketchbook with white paper that works. In this case the Pentalic mentioned above is excellent. If you just want a simple sketchbook then the A4 size should be enough. But if you plan to use it for full drawings then you might want something a larger to show off your skills. I always prefer spiral-bound over hardbound because it feels better for sketching on the go. However when drawing at a desk or on a board the spirals can elevate the book, tilting unevenly to one side. Sketchbook orientations can always be changed by flipping to page. But you also have to consider where the binding is and if that’ll get in the way of sketching. All these features can drive you batty if you’re brand new to sketching. However as you progress and improve you’ll learn a lot about paper types and artistic mediums. You’ll learn which sketchbooks work best for you and which don’t. My goal with this post is to save you time by helping you pick the right sketchbook for any situation. I’ve organized my top 10 picks here, but if you have other suggestions feel free to share and maybe we can add them to the list. First up is my top pick for beginners and advanced artists alike. The Pentalic spiral-bound sketchbook has a sturdy construction, 160 pages, and thick paper quality so you can draw heavy & dark without bleeding through. If you plan to use markers then you’ll want another book. However these pages can hold up with ink, colored pencils, or even very light markers(probably not markers like Prisma). It measures the standard A4 size of 8.5″ by 11″ so this should feel like drawing on copy paper. Each page is actually pretty smooth too, so it does replicate the feel of copy paper if you’re used to that texture. The hard covers are strong and will not bend or risk damage your drawings. It also makes the perfect surface to lean against if you don’t have a desk or board handy. For the price it’s a great buy and you get plenty of pages to work through. I recommend this Pentalic sketchbook if you need a durable choice to dive in and start sketching. It’s not great for finished work, although you can bring some drawings to a complete render if you wish. 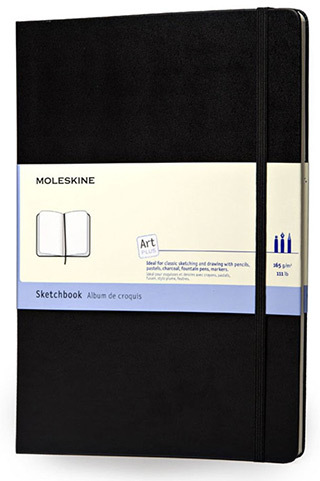 The classic Moleskine Art Plus is a favorite among artists, designers, and writers alike. It’s a universally-loved sketchbook because the brand is trustworthy and the quality is noticeable. The Art Plus sketchbook is small yet versatile. It measures 5″ x 8.25″ so you can take this pretty much anywhere. It’s a fantastic portable sketchbook that really feels like a quality design. All of the 104 pages are thread bound meaning they use thread to keep them together. This is a staple of Moleskine notebooks and it’s one reason why people love them so much. This model is a hardback sketchbook which I find ideal for artists. But they do have paperback sketchbooks if you prefer that style. I think the hardback is better for resting your palm and for keeping the inner pages free of crinkles. It’s not super hard but it’s definitely strong enough to stand on its own. You’ll get plain white paper that can hold well through ink and pencil. Plus the book comes with a wrapper elastic to mark your place wherever you leave off. This is a neat little feature so you don’t have to flip around to find the next blank page. Overall a brilliant sketchbook or notebook for any purpose. Moleskine is top quality and if you’re OK with a classic spine then you can’t go wrong with the Art Plus. 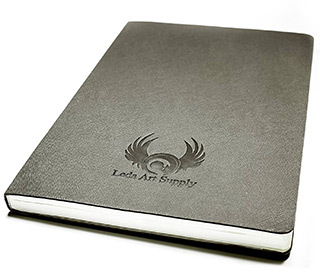 Leda is another big brand that makes their own sketchbooks for artists of all types. This particular model comes in three sizes: small(3.5″ x 5.5″), medium(5.5″ x 8.2″), and large(7″ x 10″). The smallest size is really damn small but perfect for on the go. It’s really just a doodling book because the size limits how much you can draw. Both the medium and large sketchbooks are made for fairly adept artists who want a sizable surface for drawing. They all have the same cover design, paper quality, and number of pages(160 total). These pages are dense and they can easily support graphite, ink, or charcoal. This is a softcover sketchbook so it is flexible and easy to bend. Great for storage, not so great for keeping your pages straight. And the Leda sketchbooks use a sewn binding which is much stronger than any glue or adhesive. It’s truly an au naturale sketchbook for artists, writers, draftsmen, animators… pretty much anyone! Leda’s quality is just as great as Moleskine. The biggest benefit here is the softcover binding and the higher number of pages. If we’re talking quality brands then Canson has to come up. They make some of the best art supplies and paper products around. They have an entire line of Artist Series Sketchbooks all with perforated pages, a spiral binding, and a softcover design. The largest size is really huge and measures two feet wide! The 18″ sketchbook is the only one with a landscape orientation so if you’re looking for a super long sketchbook it’s gonna be your best bet. All other sizes use portrait orientation and they all share the same spiral binding. One thing you might not like is the cover design. It uses ugly Canson branding with splash artwork as a marketing ploy. Most artists(myself included) prefer the solid black color. But this is only a beauty mark and it does not affect the quality of the pages. Each sketchbook comes with 100 full pages and supports dry mediums like graphite along with charcoal. 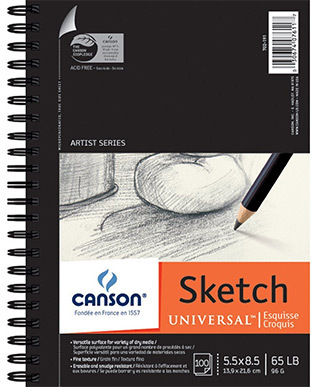 Canson is a reputable brand so their Artist Series is a great choice, especially if you’re looking for a long landscape-oriented sketch pad. I’ve been using the Strathmore Field Sketcbook for years and it’s one of my favorites. Not super thick but also not super small. It only comes with 70 pages which is on the lighter side. But every sheet is made from recycled paper which is eco friendly and often a selling point for artists. There is some grit to the pages and they have their own “tooth” and texture. These pages are definitely not flat so they can be nice for rendering(although it is sketchbook paper). The front & back are completely hardcover which is great for artists who like to draw everywhere. And the spiral binding doesn’t interfere when laying flat on the table. This is one of the few spiral-bound sketchbooks that actually lays flat(or close to flat). Strathmore’s field sketchbook has my seal of approval for beginners and experienced artists alike. It does not have many pages but every sheet comes from recycled paper and they some nice texture to avoid that flat feeling. 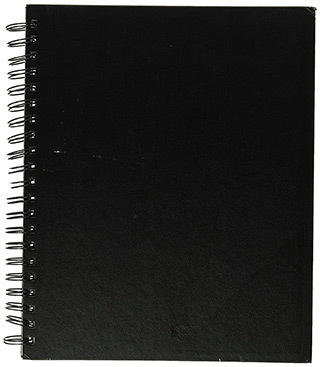 The Pro Art spiral-bound sketchbook is yet another A4 8.5″ by 11″ option for artists. This is much cheaper than others because the brand isn’t as well known. But the paper quality is similar and it works just like every other bound sketchbook. However one big downside is the quantity. You only get 80 sheets of paper which is still pretty low considering others come with 160. But every sheet is perforated and comes with a bit of texture too. This is high-quality thick paper made for ink or pencil and charcoal. Probably won’t support watercolors though. All-in-all a decent buy for the price. It’s nothing special but it does provide a sturdy sketching experience from start to finish. There are dozens of toned sketchbooks to try with different shades of tan or grey. And the Strathmore Toned Tan sketchbook is an excellent choice for breaking into the world of toned sketchbooks. This one is dirt cheap since it only comes with 50 pages and it’s fairly small measuring 5.5″ x 8.5″. But the page quality is superb and it’s my favorite shade amongst all the tanned sketchbooks. You can hit this paper with anything from graphite to charcoal, chalk to China markers or colored pencils. It’ll hold up with so many different mediums that it’s basically a universal sketchbook. Seriously this paper quality is incredible. You can absolutely use this to create finished drawings with any medium you like. And Strathmore has many other toned sketchbooks if you’re looking for a different size or color. Either way I highly recommend Strathmore for toned work(specifically for beginners). As you get better working on toned paper you can certainly branch out and try others too. 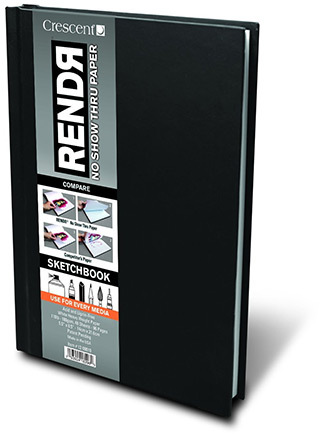 If you’re looking for a thick sketchbook that’ll handle any materials then take a peek at the Rendr Hardbound Sketchbook. It’s surprisingly cheap for such durable paper, although you only get 48 total pages. But you can use everything from ink to copic markers. Nothing will bleed through to the other side. When you draw with marker it does tend to bleed into the surrounding creases on that side of the paper, but nothing that’s noticeable. It certainly won’t ruin your drawing and you’ll learn to control it with time. With this hardback book you’ll have no trouble finding a surface to draw on. However it does slant a bit when laying flat on the table so you’ll need to consider that before buying. Finding a quality sketchbook that also supports markers is a huge task. But Render’s hardbound sketchbook is a brilliant choice for this exact task. I won’t go so far as to say Render makes the best sketchbook for markers. But I will say it’s in the top five and it’s a brilliant beginner’s book for getting into copic/prisma coloring. One thing I like about the Global Art Materials sketchbooks is the diversity of styles. 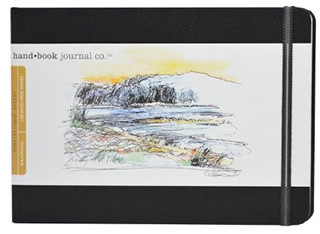 Take for example their large landscape sketchbook measuring 5.5″ x 8.25″ with a total of 128 acid-free pages. From this basic setup you can choose between four different colors for the cover(red, blue, black, and green). And you can pick from five different sizes that also support these differently colored covers. Even the “large” sketchbooks are still pretty small. Surprisingly these are resilient sketchbooks that can take pretty much anything. You can go to town with markers, graphite, charcoal, any type of ink… pretty much any mediums can work well in this sketchbook. However watch out for watercolors because they may not bleed through, but they can crinkle the pages. The sheer variety and style of this sketchbook makes it perfect as a travel companion. 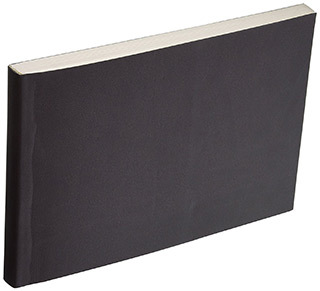 If you’re looking for a sturdy binding with smaller dimensions then this is your book. 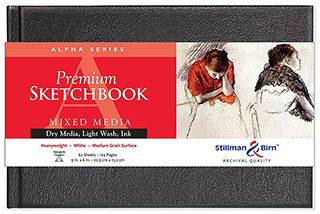 The Stillman & Birn Alpha Series has a number of great sketchbooks. I’m specifically focusing on their hardbound landscape sketchbook measuring a lofty 9″ x 6″. It’s surprising how few artists know about this brand. They certainly aren’t popular worldwide but their quality is superb. It’s also tough to find such great paper mixed into a hardcover landscape-oriented sketchbook. The paper is thick and textured. It comes with a Bristol vellum surface which is tailor made for grabbing any type of pencil, charcoal, crayon, or any similar dry medium. You only get 62 pages which can be a letdown since the price is higher than most sketchbooks. But if you’re willing to give this a shot then you might be pleasantly surprised with the paper quality—surprised enough to stick with it even with a 62-page sketchbook. If you’re a complete beginner I’d recommend the Stillman & Birn Gamma sketchbook which uses the portrait orientation while keeping the vellum paper. If you were waiting for a watercolor-focused sketchbook then you’ve finally found it! The Strathmore 400 series comes in landscape orientation with a spiral binding which is perfect for resting on an easel or a drawing board, indoors or outdoors. I’m not usually a huge fan of the fixed binding but you could also look into the Strathmore STR-483-5. However that one only comes with 24 pages while the Strathmore 400 has a total of 30 pages(mixing cold press watercolor and sketch). Strathmore’s field books are some of the best and the spiral binding makes them super easy to leave open anywhere while you work. I cannot recommend this enough for watercolorists. The paper quality is superb and yes it can be a bit pricey. But it’s also one of the strongest bindings you’ll find. If you’re looking for a portrait orientation then check out the Pentalic Watercolor Dream Catcher. It has a similar design with stronger pages, yet no spiral binding(unfortunately). Looking for the strongest sketchbook known to man? Want something so huge and bulky that it’ll take you months, if not years, to complete? 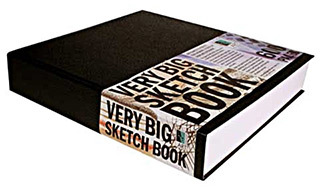 Then you’ll adore the Very Big Sketchbook made by Art Alternatives. This thing is absolutely massive totaling 300 pages(front and back) for a total of 600 sides of paper to sketch your heart away. I’m not a huge fan of the binding style but it is very high quality. This paper can support gel pens, fountain pens, all forms of graphite/carbon and even some watercolors. But I don’t recommend this as a watercolor sketchbook. Instead this works better for artists who want to watch their progression over time. In the span of 300 pages you can make a lot of progress, do a lot of studies, and learn so many techniques. I’d recommend this more for beginner-to-intermediate artists who want to keep it as a journal of their artwork. This thing is massive but it also offers a great drawing experience with thick pages and a hard cover design. So what is the best toned sketchbook? Depending on what color, size, and orientation you want, this is a tough question to answer well. But overall I do recommend the Strathmore spiral toned pads for the paper quality and binding. 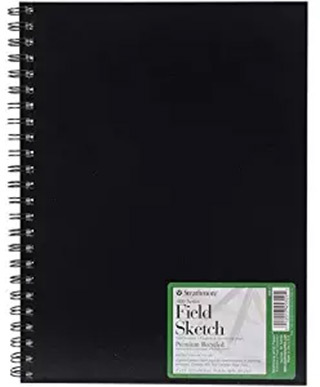 Spiral bound sketchbooks are just easier to work with(in my opinion) and they offer more flexibility whether you’re drawing on a drawing board or drawing outside in the grass. The only thing I don’t like is the size. The tanned tone sketch pad measures 5.5″ x 8.5″ which feels a bit small to me. Some artists like to use the gray toned sketchpad which is just as great. It’s a lot bigger(9″ x 12″) and somewhat easier for beginners to pick up. If you’re new to shading and lighting then a toned sketchbook won’t help you master shadows, lights, or rendering. But a toned sketchbook can help you understand how rendering works and how you can choose to leave out(or add) certain details. 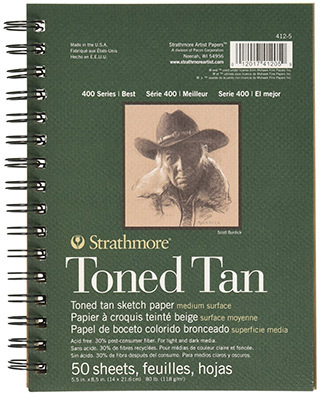 But overall my #1 recommendation here is the Strathmore toned sketchbook. There are so many different types of markers that you can use for coloring. How do you even begin looking for sketchbooks? As a general recommendation I like the Global Art Materials large landscape sketchbook which holds up well with all markers. It comes in many colors and has an elastic wrap to keep your pages bookmarked. But this isn’t always the best choice since even their largest sketchbook is still kinda small(5″ x 8″). If you want a large sketch pad for markers then the Canson XL Series is perfect. The smallest Canson size is equal to GAM’s largest sketchbook. And the Canson XL can be purchased as large as 18″ x 24″ which is a huge area for drawing/coloring. Again this all boils down to your needs. Both are great, yet both work best for different scenarios. Go with the GAM sketchbook if you’ll be coloring for fun or if you want a portable sketchbook. The Canson XL series is better for larger studies. Ultimately the best sketchbook is the one that works for you. They all come in different sizes, shapes, bindings, and with a large variety of paper styles. Picking the best sketchbook is a tough call, especially as a beginner. But it gets easier if you know exactly what you want. I recommend the Pentalic Sketch Book specifically for newer artists who just need a sketchbook to practice more often. But there is no “wrong” answer so take a look around and see what you can find.